The 4th of July just might be my favorite holiday. Especially when it lands on a Friday and the rain clouds stay away. We wake up early, human enhancement pack the food, physician the coolers and the Bocce set and head to the beach. We set up 3 tents, tons of chairs and a buffet for our friends and family. We open our first beer before noon and we eat empanadas, roast pork and tamales with our toes in the sand all day. The barge with fireworks makes it’s way over to our beach, parks right in front of our party and we drink champagne while they burst over our heads. A perfect day. I bring the empanadas, which means that I turn my kitchen into an empanada factory the eve of 4th. 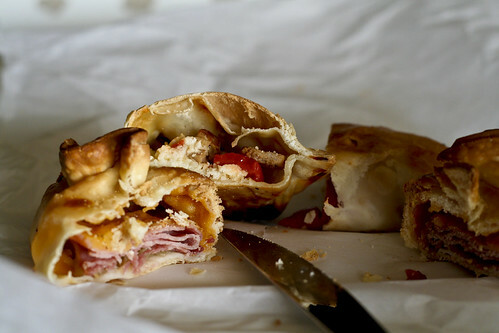 This year I managed to churn out 80 empanadas in 3 varieties – Guava and Cream Cheese; Sausage, Roasted Red Pepper and Feta; Ham, Cheddar and Green Apple. They were all gone by 3pm, which means that next year I’ll somehow have to make more. I think my favorite was the ham, cheddar and green apple, though the guava and cream cheese were the first to disappear. Just like arroz con pollo empanadas differ regionally. 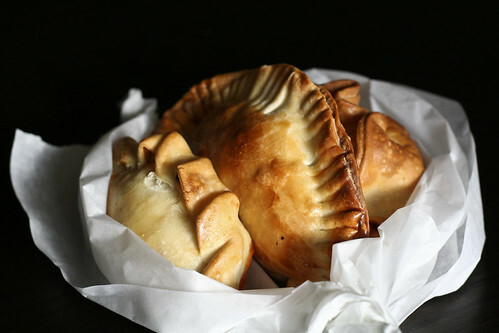 Cubans generally deep fry their empanadas, creating a flaky, bubbly crust. While these are quite delicious, I just don’t deep dry at home. Too messy. I baked them in batches of 20 – 30 and they emerged golden and delicious. Empanadas are fairly easy to make and great for large crowds. They’re also hand-held and portable which make them perfect for a BBQ or beach picnic. And they were just perfect for my perfect 4th of July. Alright, so there’s no real recipe here, just some basic instructions for empanada-making and some filling suggestions. You can really stuff them with anything you like, but bold flavors seem to work best. I like to use extra sharp cheddar, feta, spicy sausages, shredded and spiced chicken, spinach with ricotta and lots of parmesan, etc. If you can’t find guava paste (though I suggest you try – it’s delicious! ), try using thick marmalades paired with cream cheese. Anything spicy, salty, sweet or tangy is perfect. If you’re using something like sausage, bacon, chicken or beef, make sure your cook it through before you fill your empanadas. Sausages are especially tasty when browned well. If you’re using sweet fillings or deli meat (like ham, cheddar and apple), you don’t need to pre-cook anything. Just make sure your apple is peeled. I suppose you can make your own dough, but I’m a bit too impatient for that and the frozen Goya empanada shells work perfectly for me. Just remove them from the freezer 4 hours before you plan on forming them, and you’ll be good. Goya makes 2 kinds – a dark yellow corn-based dough and lighter flour-based one. I use the lighter flour-based dough. As with most dumpling-like things, you want to be careful not to over-fill them or they’ll be hard to seal and may explode in the oven. No one likes a leaky empanada! Usually, 2 heaping tablespoons is enough. For the ham, cheddar and apple ones, I use 2 slices of ham, 2 slices of apple and a big pinch of shredded cheddar. For the guava and cream cheese, I usually use a piece of guava paste that’s about 1/2-inch thick and 2 inches long and then add a heaping teaspoon of cream cheese. Lay out all of your thawed empanada shells on your work surface, then place the filling in the middle. Now, brush a bit of water along the inner edges. This will make the dough sticky and easier to seal. Carefully lift up opposing sides of the shell and pinch them together in a half-moon shape. You can pinch and roll them, or press fork tines into the edge – really anything works as long as they’re sealed well. Preheat the oven to 375° and line a couple of cookie sheets with parchment paper. Place the formed empanadas on the prepared cookie sheet, making sure they’re about 3 inches apart. If they’re too close, they’ll balloon up and merge while they bake – not pretty! Finally, brush each empanada with egg wash*, ensuring the tops are evenly coated. This will give the emapanadas a beautiful shiny, brown surface. Bake for 30 minutes, flipping the pan once halfway through baking. Remove to a rack to cool. *To make an egg wash, beat a large egg with 1 tbsp. water. I love the filling choices you made. This is a really useful post. I’ve never made empanadas, but they certainly sound easy enough. And like you said, have countless benefits in terms of crowd pleasing. agustin – next year I’ll try to make 150. I don’t know if I’ll be able to, though! cookinpanda – Thanks! Give them a try – they’re definitely crowd-plesaers. i read all about the empanadas that you were making on serious eats. i couldn’t believe how many you were making! looks great. I’m going to try these this week. the ham, cheddar, and green apple sound delicious! i can just taste the tartness of the apple looking at those pictures. mmmm. ECM – I know! 80! I was pretty exhausted by the time I was done. katie – That was my favorite, too. I wish I had some more right now! I looked for guava paste today at my local supermarket and at the Asian market – couldn’t find it anywhere locally but I did find it on line – frozen – so I’ve ordered it and when it gets here I’m going to make these – they sound amazing! This recipe looks amazing. I’m going to try it this weekend! I was going to say, your empanadas look outstanding. The shell doesn’t look too bready, leaving more room in the tummy for yummy filling! I gotta keep an eye out for that Goya brand of shells. Mmmm. I wonder if I can get these shells in the PacNW. When I first moved up here (from SW Colorado), I went looking for sopapilla mix and no one in the stores had ever heard of it. Yikes!! These look yummy though. I want to eat the ham, cheddar, and green apple variety for breakfast. Right now! Wow; that sounds much easier than I’d imagined. I’m glad you use the Goya shells. Great flavor combinations–i imagine the green apple really brightens up that savory ham and cheese. Yum! I like the sound of the ham, cheese and apple one. They all look amazing, but I don’t envy you the task of making 80+ of them! What can you use if you can’t find Goya shells? These sound fabulous! Sarah – I suppose you can make your own dough? Or, try a non-puffy, non-sweet pastry dough. Maybe even Pillsbury pizza dough cut into small rounds? Musze si? wam pochwalic w koncu zrzuci?am wag? – 8 kilo. Przeszuka?am chyba caly polski internet ?eby znalezc cos na odchudzanie i znalaz?am. Wpiszcie sobie w google: xxally radzi jak szybko schudn? ?